This play went nowhere. Probably. The Philadelphia Eagles have owned the New York Giants in recent years, winning 13 of the previous 16 matchups, although their Week 17 wins over their NJ Turnpike rivals were both of the meaningless game variety. Last week, the Eagles faced the best rushing team in the NFL. This week they'll face a team that runs the ball as badly as the Vikings, who the Eagles shut down two weeks ago. In that Vikings game, the Eagles stopped the run, made the Vikings one-dimensional, and were then able to tee off all afternoon of Sam Bradford. This is a matchup the Eagles must win. If the Eagles can stop the run as they should, they'll have some nice matchup advantages when they get into pass rush situations, specifically Brandon Graham vs. RT Bobby Hart, and Fletcher Cox vs. RG John Jerry. In case you haven't noticed, Brandon Graham has been a beast, even if he "only" has four sacks. Only Von Miller and Aaron Donald have more hurries than Graham this season. Graham also has two forced fumbles, a fumble recovery, five tackles for loss, and 25 tackles. He is playing at a Pro Bowl level. This week, he'll be going up against Bobby Hart, who really shouldn't be starting at the NFL level. That is a major mismatch in favor of the Eagles, and I suspect the Giants will give Hart a lot of help. The rest of the Eagles' defensive line will have to capitalize on one-on-one matchups. Of course, if the Eagles are successful in getting the Giants into obvious passing situations they still have to stop Odell Beckham Jr. on the back end. The Eagles have faced a number of very good wide receivers so far this season, some of which defensive coordinator Jim Schwartz noted on Thursday. "We've had some good receivers this year, really starting with Pryor," Schwartz explained. "He flew a little bit below the radar in that first game; made a couple of plays that I think that maybe we sort of looked as fluke plays. Now we've seen over the course of the season, they weren't fluke plays. "Whether it was him, Alshon Jeffery, Antonio Brown, it seems like every week there is a guy like that. Beckham is similar to the Brown in some ways. He's got extreme quickness. He can take a short pass and go the distance with it. He can threaten every inch of the field lengthwise and widthwise. And it's not just him down the field. We've got to do a great job of tackling him." Those four receivers have averaged 6 catches for 104 yards so far against the Eagles, although obviously, that's what great receivers do. They put up numbers. The Eagles' success against star receivers has been mixed. On the bright side, quarterbacks are completing just 52.2 percent of their throws to the above players, but are averaging a lofty 9.1 yards per attempt. "I said before, this guy might be the best hitch runner in the NFL, just meaning a three-step hitch," said Schwartz. "He's strong. He can stop on a dime; he's strong coming back to make the catch; and then he can run after the catch. All of those things make him very dangerous, not just down the field, which a lot of people see, but in that short area. "We have our work cut out for us. We're going to have to mix our coverages up. We're going to have to tackle when he does catch the ball because sometimes he is going to catch it, and we have to limit those big plays. He makes plays all over the field. "It's not just him, though. Their receiving crew has made a lot of plays and they obviously have a Super Bowl-winning quarterback that puts those in guys in position. So, it's not just him." 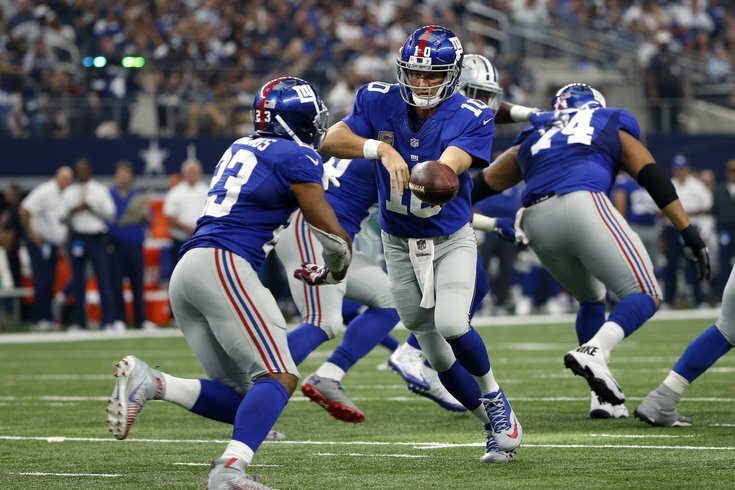 One of the surprising bright spots for the Giants this season has been their pass defense, which is holding opposing quarterbacks to a sub-60 percent completion percentage, and has allowed just 7 TD passes vs. 6 interceptions. Opposing quarterbacks have a combined passer rating of 77.5, which is fourth-best defensively in the NFL. Can the Eagles have a game in which they don't have three or four devastating drops? At some point, they're going to have to start helping out their rookie quarterback. The Giants have faced 500 plays on defense so far this season, and have only run 428 plays on offense. A disparity of 72 plays after seven games is pretty significant. As you might imagine, the Giants are not winning on third down. They are converting just 35 percent of their third down attempts offensively, while opponents are converting 42 percent of their third downs. As a result, they have the worst time of possession in the NFL (yes, even worse than Chip), with an average of 25:57. Conversely, the Eagles like to play ball control offense, as they have held the ball for 32:24 on average this season, which is third-best. The Giants' inability to run the football is the biggest reason for the above, and it plays right into the Eagles' hands.